A statement piece for the fan who sees the world through team-colored glasses. For the baseball fan who sees the world through team-colored glasses, this larger-than-life stadium blueprint is a statement piece that celebrates their enduring allegiance. Each bright and beautifully detailed illustration honors a stadium's unique history and architecture, and is accompanied by its design specs and major events. 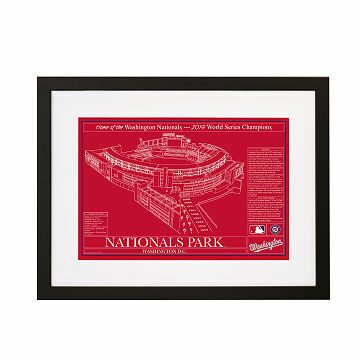 Printed on museum-grade, archival paper and framed with acid-free archival board, the print will remind your ultimate fan of all their cherished ballpark memories and the ones that have yet to be created. Made in Portland, Oregon. Check out our smaller version of the Baseball Stadium Blueprints Team Colors here, our original Large Baseball Stadium Blueprints here and our Team Color Pillows here. It is now hanging proudly in our living room.